Eduardo Santana on the left is from Guadalajara, he’s a biologist (with a penchant for birds) and he’s currently working on creating a new natural science museum. He’s here to gain perspective to help him shape the museum, which they hope to launch in 2011. 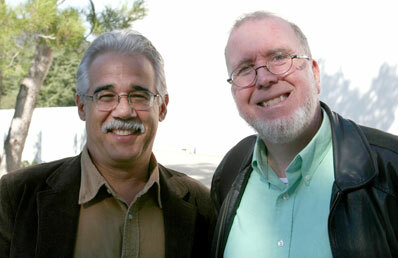 Kevin Kelly is a speaker at EG. He has a incredibly short domain name, kk.org, and here’s his Wikipedia page. This entry was written by Matt, posted on December 2, 2007 at 1:50 pm, filed under Uncategorized and tagged eg2007. Bookmark the permalink. Follow any comments here with the RSS feed for this post. Post a comment or leave a trackback: Trackback URL.